Okay, the rest of this post will be about the writing of the episode. WARNING: There will be spoilers for episode four from here on out, so don't read any further if you haven't seen it. Barry and I just finished watching Episode Four of Ragged Isle right before he exported it and I am excited. Wow. I cannot believe that we are not even half way through the first season. There is so much material. I know that I was there and active throughout the entire process but I sit here stunned. I have no idea how we did this and the thought of doing it again this summer is both exhilarating and terrifying. This whole experience has been such an adventure with new and exciting experiences around every corner. I did not know quite what to expect from this but am pleased so far. I am impressed with the talent of all of the people who helped out with Ragged Isle. I am in awe of all of you and a big thank you with all of my heart for making this wild dream a reality. 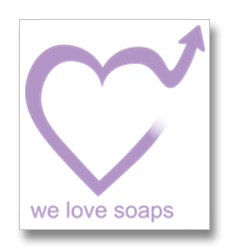 Many thanks to everyone who voted (first via write-in, then as an actual choice) for "Ragged Isle" in this week's We Love Soaps Indie Soap of the Week Poll. Once again, we took the top slot, right above the excellent (and at least equally deserving) "Blood and Bone China." 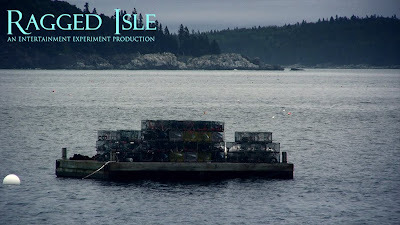 Please check them out as well, and tell them "Ragged Isle" sent you! Once again, thanks to everyone who voted! Ragged Isle is added to weekly poll! 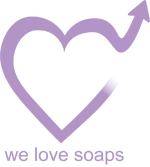 Thanks to Roger at welovesoaps.net we have been added to the "Indie Soap of the Week" poll. Now it's super easy to show your support for Ragged Isle. Please head over there and vote for us. We truly appreciate your support in getting our series the recognition it has. Ragged Isle "Share Episode 3" T-Shirt Giveaway Winner! Who was the lucky winner? Sheriff Dalton was kind enough to take a moment to pick the winner of our giveaway. Who won the t-shirt? Watch and find out! "Ragged Isle" episode three is up, and it's a good one. If you haven't seen the first two episodes, you should definitely watch those first. And after you watch episode three, read through to the rest of the post for a behind-the-scenes perspective from the head writer. There, did you watch? Wasn't it cool? Okay, if you're all caught up, keep reading for a little peek at how the sausage is made. WARNING: There will be spoilers for episode three from here on out, so don't read any further if you haven't seen it. Calling all Ragged Isle fans! Let's make it two in a row! Looks like we have been nominated for "Indie Soap of the Week" again at welovesoaps.net. Get your voting finger ready and head over to their polling page to vote for our series. Voting closes on Wednesday. Thanks as always for your continued support in getting Ragged Isle recognition. We are all proud to have you as fans! One day after winning the Indie Soap of the Week poll from We Love Soaps, and one week after getting an honorable mention from the Indie Intertube podcast, we won Drama of the Week from Indie Intertube. To quote the host, episode two is "even better than episode one." Winning! As always, you can track all the coverage we're getting on our press page. Huzzah! With our premiere episode, we won the Indie Soap of the Week Poll on welovesoaps.net! Many thanks for your votes, everybody. Also, like they say over at We Love Soaps, check out some of the other entries. May we recommend, "Blood and Bone China." It's a European Vampire period piece. VERY impressive stuff! "Cthulhu lives in that frickin'... ocean around that isle! He just spawned inside that guy's head. I don't know!" "Is there a Maine relative of 'Nessie' in those waters, or is the government working on a secret underwater robot?" Those are two good theories, certainly. But what do you think? Sound off in the comments. And a new episode will be up tomorrow. Maybe it will reveal everything. Stay tuned! Help us make a splash! Support Ragged Isle! Please vote for us, and share with your friends! We are up for Indie Soap of the Week on welovesoaps.net! Would be a nice feather in our cap. 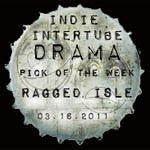 "Ragged Isle" got some national attention last night when it was reviewed on "Indie Intertube," a weekly podcast devoted to original web programming. Their take? A rave! To quote the host, "I'm in love with this show." Hooray! We've been getting a bunch of coverage lately -- all of which you can read, listen to, or watch on our press page. Stay tuned for more, and please consider (politely) encouraging the producers of of the local show "207" to have us on their program. The season one episode is uploading as I write this (12% last I checked.) 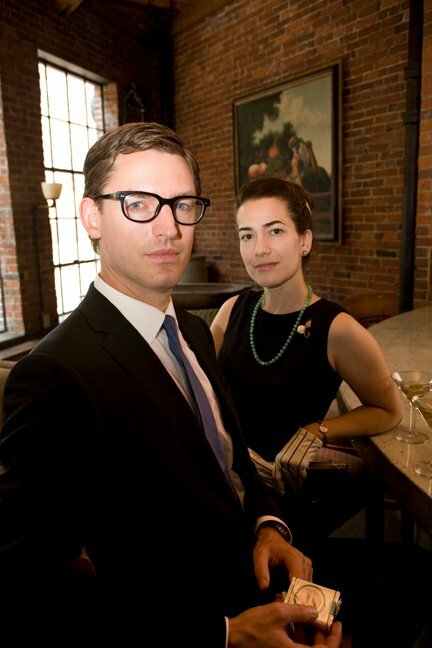 In the meantime, PLEASE check out this article from the Bar Harbor times. Karen was interviewed by Laurie Schreiber and she did amazing! Got a nice email from a nice fan (we have to come up with a cool name for our fans) named Perry this evening. "Can’t wait for the first episode. I invited a houseful and some party food and I'm hooking the laptop to the big screen TV." Thanks Perry! Totally made my night. One request, turn your lights off and crank the sound! 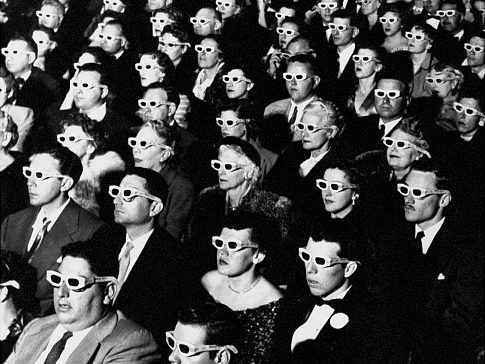 How will you watch our first episode? Send us a picture! We'll put it up on the facebook page! 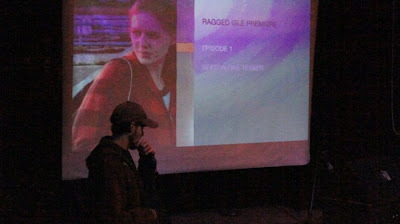 Want to know what time Ragged Isle's premiere episode hits the web tomorrow? Subscribe to our youtube channel and receive an email the second it's up! We will of course update facebook and here on our blog once it's live as well. Uploading videos is tricky and depending on internet traffic it may take minutes or hours to get the video uploaded and converted. We hope to have it up by noon eastern standard time. Thanks for all your energy and interest! Believe me, we are equally as pumped to get this in front of your eyeballs as well. Next stop Ragged Isle! Great article at village soup today. Thanks a bunch to Dagney C. Ernest for the wonderful article! A couple folks have told us that apparently we also got a mention on WCSH & WLBZ Sunday morning regarding our Premiere Party. So that's cool. Thanks NBC peeps! We're still hoping to get on their show "207" and could use any and all help (friendly persuasion) to make that happen. Tomorrow morning is going to be big! I have the honor of bringing two of our lead actors Meghan Benton and Ian Carlsen to be interviewed live on Good Day Maine. We'd be honored if after the interview is finished if you would send them a little thanks for putting us on and supporting local film. Facebook makes it so easy to give a pat on the back to coolness. If you're on the facebook and have a hot minute, please show them some love! The bands were great. It was so much fun to see a whole bunch of people I only know from "Ragged Isle" on stage in a completely new context. Doug Porter especially was a revelation: That guy can play a guitar! And I loved watching Barry be a rock star. But on with the show: Barry's shown me a lot of footage over the past few months, but I had never seen Episode One start to finish. Wow. It's one thing to sit around a writers' table and break story points, and it's another thing to see the story laid out in a script, and it's yet another thing to watch the actors perform the lines on the set -- but it's a whole other universe to watch it once it's passed through Barry's magic hands. The music, the editing, even the credits -- the whole look of the show was amazing. Great job, Barry. You should be incredibly proud. The crowd went fairly nuts over the episode, as well as the Season One teaser Barry put together -- which by the way, was also amazing (while giving away only the barest hint of the overall plot). All in all, the night couldn't have gone better, with the exception of the very expensive speeding ticket I got driving home at 1:30 a.m. It turns out that driving 70 mph on the Turnpike in a 55 mph zone is... ill-advised. Tomorrow night is the Ragged Isle Premiere Party and we are so ready. It is a night we have discussed and worked towards throughout the entire project. A celebration of Ragged Isle and of the vast and varied talents of the cast and crew. I have watched the first episode countless times in parts and pieces but to see the entire package as Barry has created it is something to behold. I am, at this moment, bugging him to watch it but he is exporting it for tomorrow so I cannot. It is a great piece of entertainment and one that I am so proud to be a part of. We will also show a sneak peak for the rest of the season that shows a great deal without revealing too much. It is beautiful. We have done interviews with WMPG, The Village Soup in Belfast, and the Bar Harbor Times. We are setting up an interview with the Bangor Daily News next week and are working on other press items. It is all very exciting and nerve wracking and I would only do this for a project that I love this much. I hope we keep these press items coming and that we get more of you involved. Here's my interview from last night on Cinema Hits and misses on WMPG. At one point, you'll hear Zarra say "Glorious Filmmaking." I nearly pooped my pants! Weekly discussions on two recent feature films. LIVE radio! Call us when we're on-air at 207-780-4909. Cinema Hits & Misses has two teams of reviewers; Zarra & Jenny alternate weeks w/Gail & Dawn. Thurs Mar 3 8pm: Interviewing local film maker Barry Dodd about "Ragged Isle" web series & reviewing "Somewhere"
Thank you for supporting community radio! Your feedback, film opinions are encouraged & welcome. "Zarra & Jenny: Photo by Claire Houston"
This one from the first minute of our premiere episode.